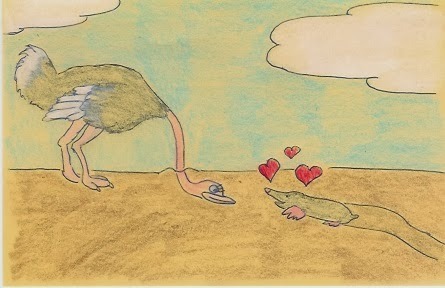 At first the ostrich fell deeply in love with the mole. Before long love turned into bitterness. They couldn't go see "American Hustle" because the screen was too bright. He never wanted to go out during the day, they didn't read the same books and when it came to decorating their new apartment all he wanted for the nursery colours was grey or black. Soon the bitterness turned into sniping at him saying things like "I suppose we are going to have to get a seeing eye dog now? Like we need another mouth to feed!" Both the mole and the ostrich knew it was over. She took the apartment, and locked the door to that unneeded nursery, soon she forgot it was there. When guests asked, she would just say, "It's an old junk closet. God knows what is in there."